With the ordination today, October 18, 2011, of the Most Reverend Gregory J. Hartmayer as the 14th Bishop of the Roman Catholic Diocese of Savannah, Georgia, we are treated to a rendition of the Bishop’s arms marshaled (to sinister, on the right in the shield below) with those of the Diocese (to dexter, on the left). An announcement on the Diocese’s website at http://www.diosav.org/bishop-elect-coatofarms gives a full description of the arms and accompanying emblems, which you may find worth reading. I always find it interesting when we are given the reasons for the particular colors and charges that have been selected for a coat of arms (or, as here, two coats of arms, though marshaled on a single shield). I may not necessarily personally agree with the choices, but they are almost always a fascinating study of heraldry. The design of the cross is rather disgusting, though. But I suppose that, in this degenerate modern age, it's important to be hip and trendy. 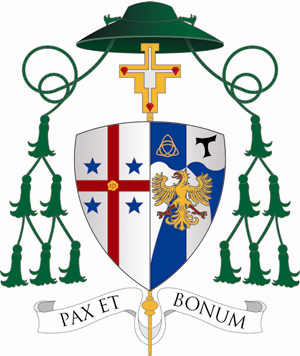 I note that the design for the diocesan arms are much less ugly than his personal arms. I'm sure that says something significant, although I don't know what. Perhaps that the diocesan arms, contrary to the way it often works, were not designed by a committee, but by someone who actually understood something of heraldry?